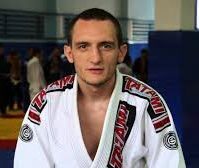 Evgeniy Skirda has founded club of Brazilian Jiu-Jitsu in Kropivnitskii city. Evgeniy together with his sport team train children and raise sporty, health and wise youth in “Borets” club. Now the club is visited by more than 120 participants. Some of them are European and world champions. This work does not bring Evgeniy big financial profit; nevertheless he takes a great enjoyment in it. Evgeniy has told us why he returned from Portugal to Ukraine, how he started doing jiu-jitsu and why he founded his own sport club in Ukraine. “After graduation, I started to work and earn money. For some time I lived with my mother in Portugal, but being 15 years old I decided to come back to Ukraine. I want to live, work and develop at homeland. At the beginning of my second year abroad, I began to feel that I was going crazy. It was very difficult psychologically”. “When I lived in Portugal, I turned onto computer technologies. At first I installed computers and satellite dishes and received my first money. Returning to Kropivniskii I started working in the advertising agency. Then I realized that I didn’t want to work for someone and started freelancing. In general, I started working at the age of 15. At the same time I studied at the Cybernetics and Technology College. Two years I studied and then realized that I do not need it”. “After that I went to work in Moscow. I opened my own web design studio there, but in 2008 I again returned to Ukraine”. “I’ve been fighting all my life. By the way, in Portugal I was engaged in judo. But there was unpleasant situation there, which became one of the reasons for my desire to return to Ukraine. I showed good results during the qualifying round, but I was not allowed to take part in the championship, because I was not a citizen of Portugal. A few weeks after that case I returned to Kropivnitskii. In Ukraine I started to work and go in for sport. One day I get serious knee injury, after which I discovered jiu-jitsu. This kind of sport is considered to be the least traumatic of all kinds of fighting, as the fight is mostly held on the mat”. “At first we trained with my friend in the basement, but then I realized that it is inefficient work. As a result, I found and contacted with the president of Brazilian Jiu-Jitsu office in Kiev, Artem Sidorov, who became my first mentor. In 2013, he came to our city (Kropivnitskii) and held a seminar”. “At that time this sport was not developed at all in our city. At the same time, it was very popular in the United States of America. There is a hall for jiu-jitsu in each American district and street while we had only one jiu-jitsu section for the entire region”. “Honestly, I’m not keen on football or track and field. I like only fighting. When I have injuries, I force myself to lift the bar to maintain my physical condition, but I do it forcing myself. I like only to fight. Sport is my lifestyle. You know, every person must have something to be motivated with. I find motivation in training children. Thanks to this I can realize myself. And when there is no time for training, I even start to fall into depression”. “Of course, work I’m doing now cannot be called my profession, as I do not get money for it. But it is not a hobby, but rather, a kind of addiction for me. All the time I think about our club’s development. Money is needed to pay renting and salaries to coaches. The income of the club is formed from voluntary contributions, and children from low-income families can train for free”. “Girls are also members of our club. At first, I was against it but later I understood that it isn`t a strength sport. Most parents don’t understand why their daughter should visit trainings on fight. But it is very useful for their development and health”. “Jiu-jitsu is a kind of philosophy and not a fight. The meeting of sportsman takes place on the mat and without use of blows. It is known, that this martial art is based on principals where person with poorly developed constitution can successfully defend himself and win against stronger opponent if he will use proper techniques”. “It happened so, that martial art at once is associated with fight. But jiu-jitsu fighters don’t beat each other. The body-checks aren’t used in this sport. You will know the rules of jiu-jitsu and you will be able to stand up for yourself in any situation”. “We are aimed at high sport results. I think that in the nearest future our club will become one of the strongest ones not only in Ukraine but in the world. In order to achieve such goal, it`s necessary to start with children. That’s why we mainly train children”. “Once I had a dispute with my student on the topic of success. He believed that successful person must be rich. For me, successful person is those one who are happy and has everything he needs”. “Yes, I do not have a villa or car, but I have my favorite deal and my team. I know what I do every day and I do it with a great pleasure, so I consider myself to be absolutely successful person”.